It's heartfelt Creations Inspiration Wednesday and today I have a card I created for the release of the fabulous Winter's Eve Collection. 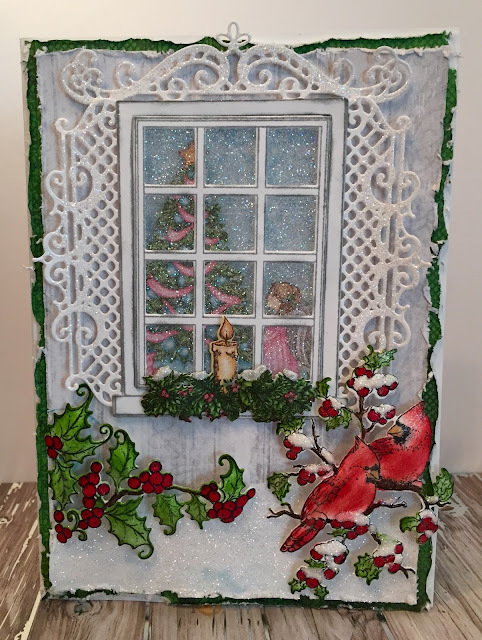 Celebrate the more simple side of the holiday season, and add a touch of nostalgia and wonder to all of your holiday themed greeting cards, scrapbook layouts and altered art pieces with the new Winter’s Eve Collection by Heartfelt Creations. Reminisce Christmas blessings from years gone by with a tranquil collection featuring an array of illustrations bringing back memories of silent nights by candlelight, choir voices resonating from the little church in the wildwood, woodland creatures foraging for food beneath the glistening snow, windows illuminated with the soft glow of a warming fireplace, and beautifully decorated Christmas trees ready to engage the imagination and excitement of little boys and girls eager to see what lies beneath them on Christmas morning! A charming and peaceful paper collection delivering a color palette of icy blues, pine greens, poinsettia pinks, berry reds and frosty whites filled with decorative elements including delicate swirls, subtle checks, bold stripes, dainty florals and lace like accents will whisk you away to a peaceful winter wonderland overwhelming your heart with the comfort and joy of the season! Three wintry themed cling stamp sets along with coordinating dies bring a further touch of simplicity to the season with bouquets of petite flowers and foliage, an old fashioned sled and a window frame with dimensional box ideal for creating warm and inviting scenes featuring a beautifully illustrated candle arrangement, Christmas tree or glowing fireplace. Three intricate and ornamental dies lend themselves beautifully to creating breathtaking decorative die cuts for accenting all of your winter wishes. Come along with us as we set the scene for a tranquil winter’s eve and a happy holiday season! Other Products: Distrezz-it-All, White Cardstock, SU Gumball Green Ink pad, SU Real Red Ink pad and marker, Dimensional tape, Double sided Adhesive Sheet Memento London Fog Ink, sponge, paint brush. Instructions: Cut a 5” x 7” card base from white cardstock. Cut two pieces from the green paper in the paper pad 4 7/8” x 6 7/8” and one piece from the light woodgrain paper from the paper pad 4 3/4” x 6 3/4”. Distress all the edges. Glue the light paper to the green paper as shown and adhere to the card base using dimensional tape. Adhere the second piece of green paper to the inside. Stamp the window with Memento London Fog Ink, cut using the matching die and ink the edges. Cut double sided adhesive sheet to fit behind the window and adhere. Cut clear cardstock to fit behind window and adhere to adhesive sheet. Sprinkle Crystal Ultrafine Transparent Glitter on the front of the window where the adhesive is and burnish. Fussy cut the angel girl and tree from the paper collection adhere to the clear cardstock. Cut the decorative window dies and adhere to the back of the window frame as shown. Cut a blue backing from the paper pad and adhere to the window behind the tree and angel with adhesive strips. Cut the candle from the paper pad using the candle die, shape, spray with Sparkle Sheer Shimmer Spritz and adhere to the window sill. Adhere the window to the card base using Dries Clear Adhesive. Add Dries Clear Adhesive to the sponge, dab the window decor and sprinkle with Crystal Ultra Fine Transparent Glitter. Paint the snow area on the paper with Dries Clear Adhesive and a paint brush and sprinkle with glitter. Stamp the Holly and the cardinals with holly on white cardstock with Memento Tuxedo Black Ink and cut using the matching dies. Color the leaves and cardinals using the stack and store daubers and Gumball Green and Real Red inks. Color the berries with Real Red marker. Shape and spray them with Shimmer Spritz. Add Dries White Adhesive to the snow areas on the image and sprinkle with Crystal glitter. Let dry. Adhere the holly and cardinals images with dimensional and dries clear adhesive as shown.. Such a pretty window scene! Love the pop of bright color from the birds and berries! This is just beautiful. I love everything about it from the candle in the window to the bright red birds...just gorgeous! Beautiful - love all the glitter effects! Oh your windows are so gorgeous! I never would have thought to cover the glass but that looks REALLY pretty! Beautiful card! Lovely window card. You are very creative,and i love your work.